Move over, sweet potatoes and Brussels sprouts! I have a new favorite vegetable side dish, roasted carrots. Like those other vegetables, carrots develop deep, concentrated flavor and golden, caramelized edges as they roast in the oven. Carrots are also affordable and easy to keep on hand. If you’ve ever been underwhelmed by steamed carrots (been there), I promise that they’re far more interesting in roasted form. Roasted carrots are an easy and healthy weeknight side dish, and would also add a welcome jolt of color to your Thanksgiving table. Today, I’m sharing my recipe for perfect roasted carrots. I love variety and I know you do, too, so I developed two fun variations as well. One is a little spicy and the other is a little more indulgent, featuring a light honey-butter sauce. Who knew carrots could be so tempting? I say “basic” because these are not boring! Roasting really brings out carrots’ best qualities. 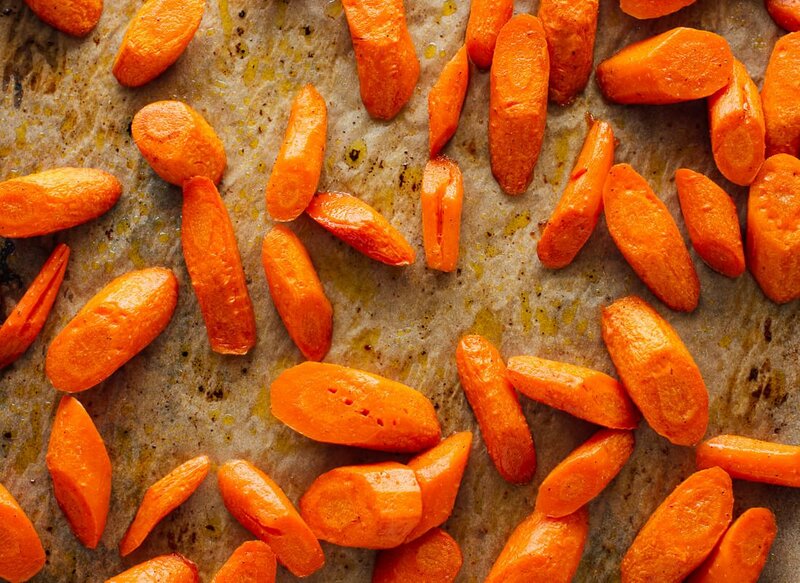 To make them, just toss carrots with olive oil, salt, and pepper. Bake until they’re golden on the edges and tender throughout. Serve these simple roasted carrots with traditional or heavy main dishes, like standard Thanksgiving fare, lasagna or mac and cheese. 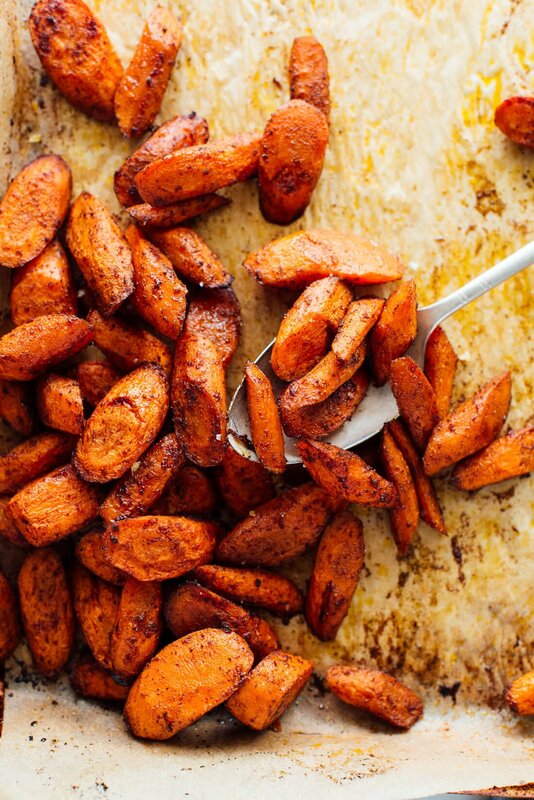 If you’re a fan of spicy sweet potatoes, you’re going to love these spiced roasted carrots. 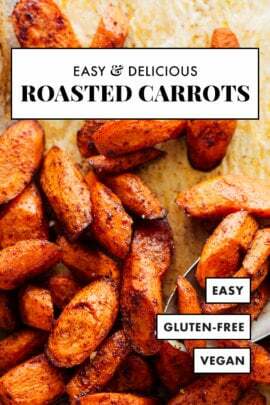 You’ll make them in the same way as the regular roasted carrots, but toss in a hefty amount of chili powder and ground cinnamon with the olive oil and salt. Those two spices might sound like an unlikely pairing, but work so well with the sweet and savory carrots. I offered a range for chili powder so you can control the spice level. You could serve these with hearty Mexican dish, like enchiladas. I also incorporated these into a Moroccan-ish salad in my cookbook (page 62). 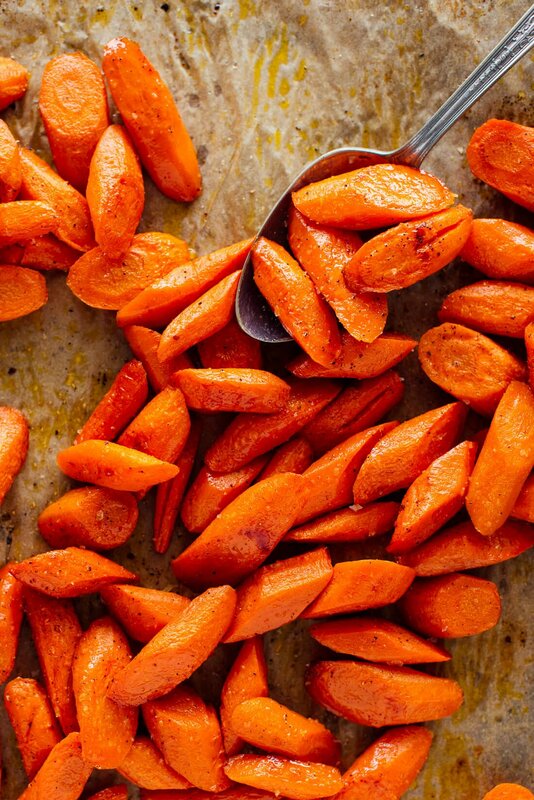 If you aren’t sold on roasted carrots yet, these honey butter carrots will convert you. 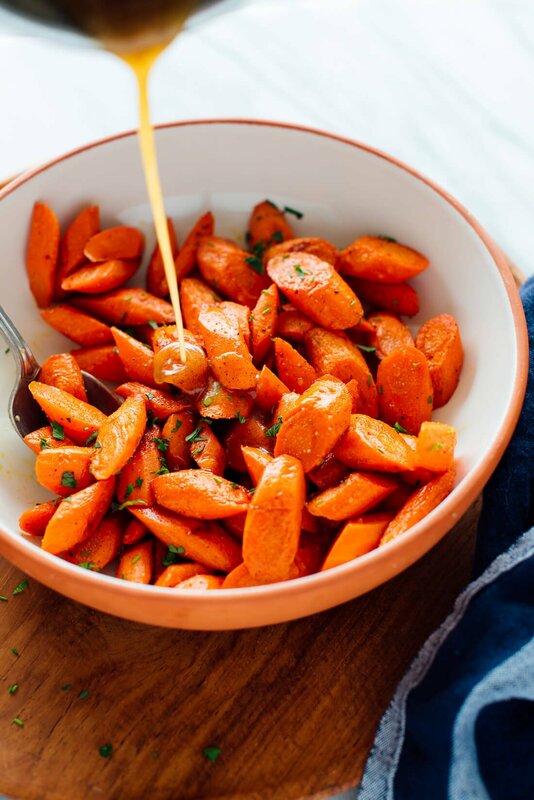 These are basic roasted carrots, tossed in a super simple honey-butter sauce that you can make on the stove in under 5 minutes. You’ll just need one tablespoon each of butter and honey. For maximum flavor, let the butter brown for a minute before removing it from the heat and stirring in the honey. Please let me know how your carrots turn out in the comments! I love hearing from you. Who knew carrots could be SO good?! Roasted carrots are an easy, healthy and affordable side dish. 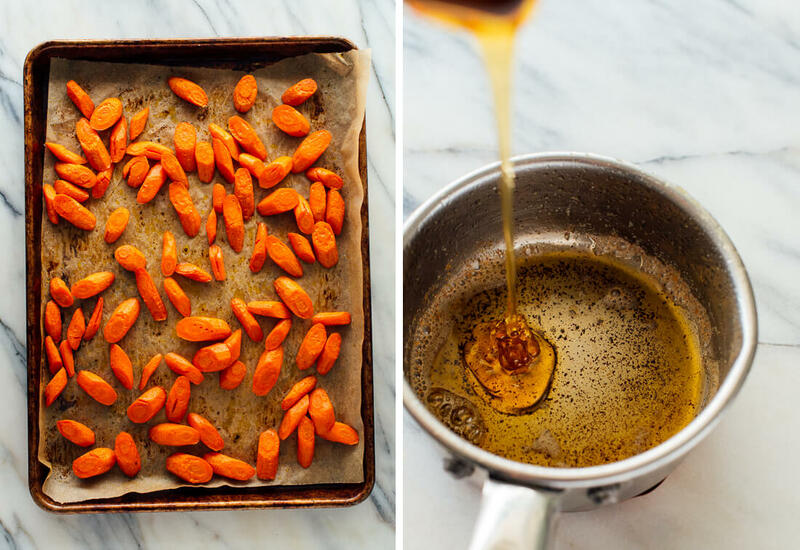 This is the only roasted carrot recipe you’ll ever need! Recipe yields 4 to 6 side servings. Preheat the oven to 400 degrees Fahrenheit. Line a large rimmed baking sheet with parchment paper for easy cleanup, if desired. To prepare your carrots, peel them and then cut them on the diagonal so each piece is about ½″ thick at the widest part (see photos). Sprinkle fresh herbs over the roasted carrots, if using. 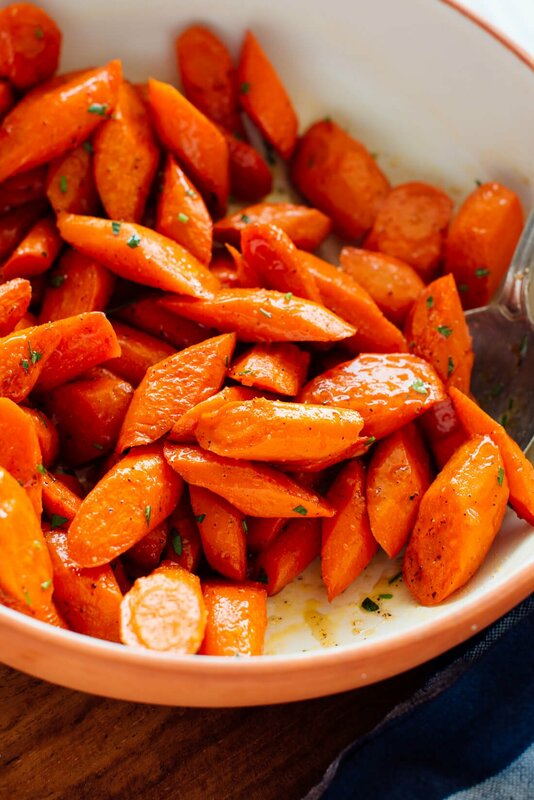 Serve the carrots warm, straight from the sheet pan or from a serving dish. Leftover carrots will keep well, covered and refrigerated, for 3 to 4 days. Gently reheat before serving. 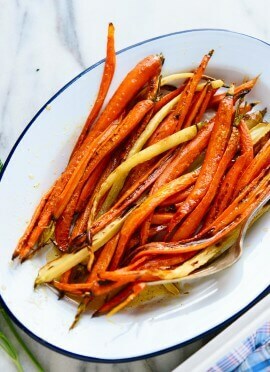 Recipe adapted from my cookbook, Love Real Food, and Andie’s honey butter roasted carrots. *If you’re making the spiced version: Add the chili powder and cinnamon with the olive oil and salt. **If you’re making the honey butter version: When the carrots are nearly done baking, melt the butter in your smallest saucepan over medium heat. Once melted, cover the pan to avoid splatters and continue cooking, swirling the pan occasionally, just until you start seeing golden flecks at the bottom, about 2 minutes. Remove the pan from the heat and stir in the honey. Once the carrots are done, drizzle the mixture over them and toss to coat. Make it dairy free/vegan: Simply make the basic or spiced versions. 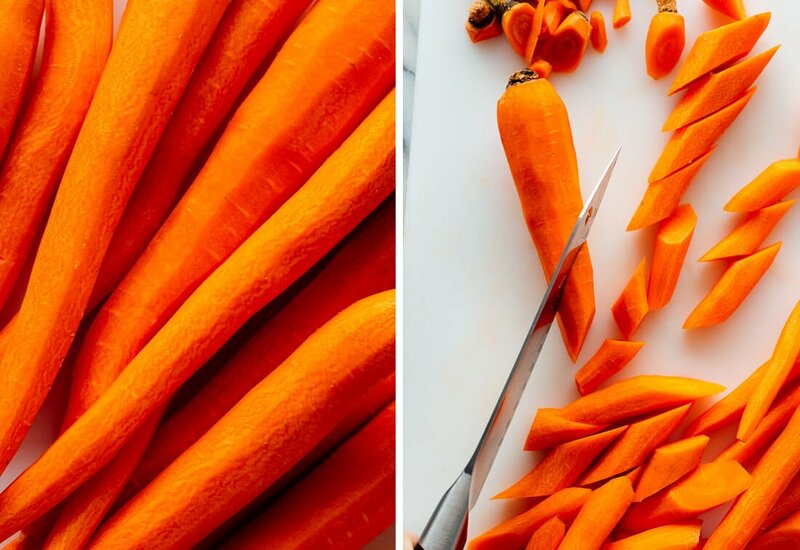 Prepare in advance: You can peel and slice the carrots in advance. For maximum freshness, store them in a bowl of water in the refrigerator until you’re ready to roast them. Drain and pat dry before proceeding. 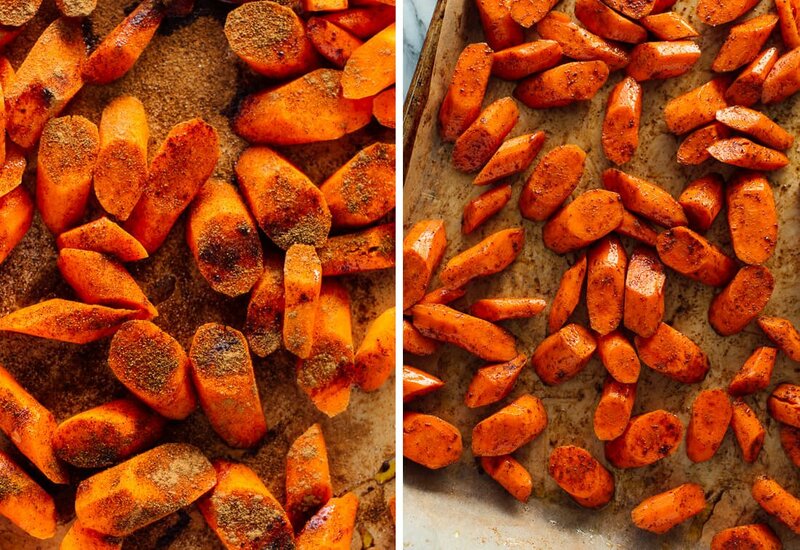 Double it: You can roast two pans of carrots in the oven at once. Just position two racks near the center of the oven before you preheat it. When you toss the carrots halfway through cooking, swap the pans on their rack positions (from top to bottom, and bottom to top). Great looking recipe. I was wondering if you could give any feedback on how to develop recipes on your own? I usually don’t write a lot of what I do down I just go with my gut and often I get inspired by what I read and see or try elsewhere. Any advice? Thanks!!! Hi Antonio! Sounds like you’re a natural cook, and if that’s working for you then I don’t think you need to change anything! You might appreciate this article on how to write a recipe, though! Thanks for such an insightful read and thank you for taking the time to respond. Love your book and what you’re doing. Keep on keeping on! Made the cauliflower soup. Loved it!! Easy and creamy without cream. Who would’ve thought plain oul’ carrots could look so appetizing! Right?! Let me know what you think when you try it. Roasted carrots are such a great side dish: I love how you make the carrots themselves be the star of the dish by not overpowering them with other flavours. Great recipe! We make honey roasted carrots and also make maple glazed carrots (we live in Canada after all!). It really is a game changer to put the extra time into the sides versus just simply boiling carrots. So much more flavour! That does sound delicious, Susan! 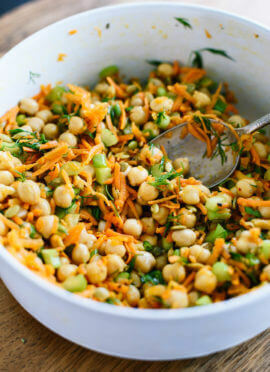 Love recipes that highlight under promoted veggies. Let the “Carrot” shine. Great recipe Kate. My favorite is the spicy version. Question: Does Cookie like carrots? My dog eats pretty much anything that hits the kitchen floor, EXCEPT carrots. I have one dog who loves carrots, raw or cooked, and another who only likes them cooked. Try making a purée after roasting (or boiling) with a little hot water and add a small amount of Kerrygold butter or virgin coconut oil. Both of my dogs LOVE this treat. I make it with coconut oil for myself, add cinnamon and serve it warm for breakfast topped with pecan pieces. It turns out like a pudding and is very comforting and nourishing on a cold morning. It’s less starchy than oatmeal, doesn’t need sugar and keeps me full longer. I can’t wait to make the roasted carrot with the honey butter this Thanksgiving. I hope my family will enjoy it as much as I think I will. 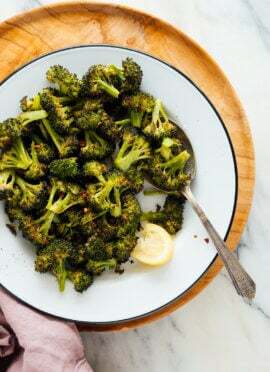 I will never get tired of roasted veggies—they’re just too good! Made the basic version of these last night just to give them a try. Yum! They had almost a sweet potato taste to me. So easy! I’m looking forward to trying the spicy version as well. Thanks for trying this recipe, Paul! I’m one who actually likes steamed carrots, with a little melted butter. The flavor of steamed carrots is much nicer than the flavor of raw carrots. I also like them roasted. I am very intrigued by the spiced version. I’d do it with the smaller amount of chili powder, for the sake of my stomach. I know that chili powder and cinnamon go well together. Thanks for a great idea. Just made the roasted carrots, wow! These were fantastic. I’m really happy to hear that, Michael! We love roasted carrots at our house! I recently tried a new recipe for roasted carrot and black bean crunchy tacos! You roast you carrots with cumin (I add chili powder) and make an easy batch of re-fried black beans similar to yours on the stove. Then you layer both into a crunchy taco shell with avocado (I use your simple guac from your cookbook) and whatever else you want. It’s so simple but its become one of our favorite meals! When I made them, I literally had the thought “I need to tell Kate about these!” Is that weird?! Thanks for this post! I like that idea! Thank you for sharing, Rebecca. can I bake them at a lower temp for longer? I found this method worked the best for me. You could try it. Although carrots are more dense/harder and could take longer than expected at a lower temperature. You’re welcome! Thanks for your review, Pam. If you want to use the recipe “carrotts made three ways ” and you want to make it the “spiced way ” do you use only this recipe or do you use the entire recipe ? Take the basic recipe and then add on the additional ingredients and steps for the other variation.